[AUDIO PREVIEW] Naftali Schnitzler Presents: Shmueli Ungar – Mach A Bracha! Shmueli Ungar is set to release his second studio album, produced by Naftali Schnitzler featuring 13 brand new songs! 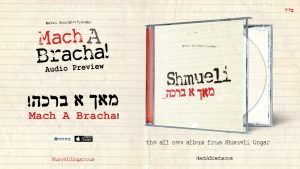 Shmueli’s album, titled “Mach A Bracha” is sure to inspire you, and become the next song to hit constant repeat on your listening devices! Mach A Bracha looks to remind us that no matter what situation we find ourselves in, we need to look all around us, and see the Brochos where sometimes we may not even realize they are. This all new album consists of songs composed by Pinky Weber, Hershy Rottenberg, Beri Weber, Naftali Schnitzler, Hershy Weinberger, Shmueli and Yonah Lipschitz. Music arranged by Refoel Sofer, Naftali Schnitzler, Shlome Wechter, Yehuda Gelili, Hershy Ginsberg, Pinky Weber, Duvid Fink, Shloime Salzman and Nachman Dreyer. The CD will be in stores in the next week, and distributed by Nigun Music, and available online to download on Nigun Music and iTunes.